Woodbridge, VA---Wet grounds and the threat of severe thunderstorms have postponed the series opener between the Potomac Nationals (56-49, 19-19) and the Myrtle Beach Pelicans (50-60, 16-24) at Northwest Federal Field at Pfitzner Stadium. The game will be made up as part of a doubleheader at Northwest Federal Field on Tuesday, August 14th at 5:00pm. Friday night's George Mason Pride Night as well as the Juan Soto "From the Pfitz to the Show" commemorative card giveaway have both been rescheduled for Friday, August 24th. 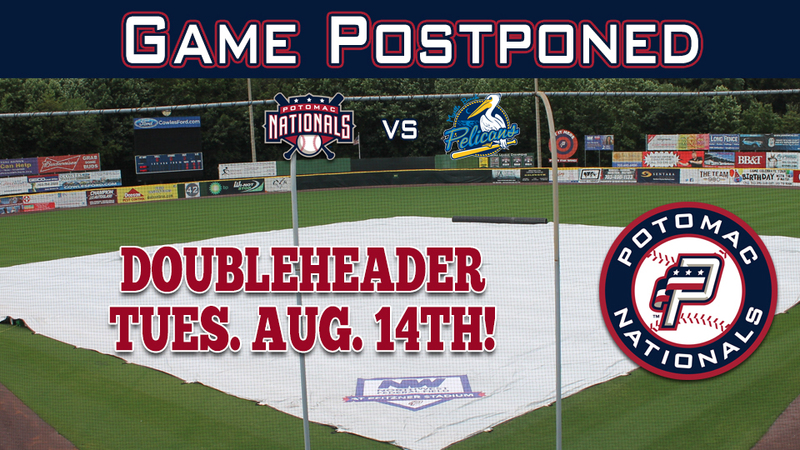 The P-Nats and Pelicans will now begin the series on Saturday with a previously scheduled doubleheader. First pitch of game one on Saturday is set for 5:30pm. Both games are scheduled for seven innings. Gates will open for the doubleheader at 5:00pm. Saturday night, take in the doubleheader, and come out to the ballpark for the 25th anniversary celebration of The Sandlot! The first 1,250 fans can take home a Chauncey Leopardi bobblehead, presented by Northwest Federal Credit Union. Leopardi, who played the role of Michael "Squints" Palledorous in the movie, will be on hand for a celebrity meet-and-greet and autograph signing for P-Nats faithful! Autographs are on a first-come, first-serve basis, with the line set to begin when gates open. Saturday is also another theme jersey auction, set to benefit Boys & Girls Clubs of America, as well as another Scout Night at the ballpark. Fireworks will follow the doubleheader! First pitch of game one of the doubleheader is set for 5:30pm.